Partnership, Engagement, Involvement: Is It Really Just Semantics? Whether we are members of the school, community, or family, the goal is always the same – for families and schools to engage with children in a meaningful partnership, regardless of the descriptive term. When defining what is understood by engagement, involvement, or partnership, there must first be “a profound recognition that parents are the first teachers and that education begins before formal schooling and is deeply rooted in the values, traditions, and norms of family and culture” (Sara Lawrence-Lightfoot). Further, both schools and families must be clear on each other’s expectations for involvement and engagement in order to avoid misperception or misunderstanding. But what does it really mean to be partners in children’s learning? Parents in partnership, school involvement, parent involvement, parent engagement, family engagement, involved families, engaged families. I see all of these phrases in the letters sent home, in the policies, on websites, and in the media. I’m confused. What are they and how do they impact what we do with our children? Terms and definitions that are chosen to refer to home-school relationships are closely related to the goals established by both parties, as well as families’ and schools’ respective understandings of the expected roles within the school landscape. (See Bringing Marginalized Parents and Caregivers into their Children’s Schooling). Some families support the school when necessary, and take care of the out-of-school commitments (e.g., extra-curricular activities), anticipating that the school takes care of academic and school-related issues. They ensure that they send their children to school well-fed, well-rested, and well-loved; they do not view their role as being an extension of the school day, or carrying out tasks that bring them back to the school and away from their families. Although to the school, they may appear less involved, they are fully engaged in their view – they are responsive to the needs of their children and this is what matters most. Other families attend School Community Council meetings and Parent Involvement Committee meetings, accepting their role as advocate, ensuring that voices are heard, both their own and those they feel may be marginalized or silenced. Some willingly support fundraising initiatives, attend school community gatherings, participate in parent-teacher conferences, read the class/school newsletters, blogs, websites. And then there are others, who look to the school for advice on how best to support their children’s learning and well-being. How does your school community conceptualize the role of families? Do you talk about parent involvement, parent engagement, family involvement, family engagement? Is it participation in school activities, volunteering in school, or fundraising? How are families’ and schools’ goals for children reflected in both their understanding and practice of engagement/involvement? What impact might a definition of engagement/involvement have on families’ presence in and out of the school building? Parent involvement (intermittently used with school involvement) often refers to a one-way relationship that includes such things as reading newsletters, attending parent-teacher interviews, having school-based discussions, reinforcing school tasks at home. When we hear phrases such as parent involvement is overrated, it is often to these types of tasks, researchers are referring (see The Broken Compass: Parental Involvement and Children’s Education). Tasks such as helping during the day, participating in field trips, supporting classroom activities all fall into this category. Family involvement is a slightly more inclusive term, recognizing that for many children, there are different family structures that might include extended family, foster families, caregivers, etc. but is characterized in a similar way. Family engagement uses the more inclusive term of family and the stronger action of engagement to indicate that families’ roles extend far beyond involvement and participation. It recognizes that engagement extends beyond the walls of the school and is not necessarily an extension of school. Adopting this view requires us to ask families, “How are you engaged? How would you like to be engaged?” Engagement recognizes that families have unique strengths and are often engaged in ways that are not necessarily reflected in mainstream school activities focused on academic achievement. Engagement is characterized by attentiveness to what families feel are best for their children, acknowledging families as collaborators in meaningful, relevant, and accessible ways (see Supporting Families as Collaborators in Children’s Literacy Development). While it is commonly acknowledged that family-school engagement supports both student well-being and student achievement, it is often a difficult ideal to attain, and one that requires a shift to our mindset. Not only do school communities need to acknowledge families as the first and most powerful teachers of their children, but they also need to see them as continuing educators with a role to play on the landscape of school. Families need to value, and be valued for, their role as ongoing educator, partner in their children’s learning and well-being. Examine the language used in family-school communication. Do you refer to involvement, engagement, partnership, participation? What message are you sending? Agree upon terms, definitions, and practices to ensure shared understanding? Establish early and often the goals of family-school engagement. Engage families, school community councils, school personnel in the assessment of your school current purposes and practices related to family-school engagement. Prioritize goals and establish a plan to enhance engagement, particularly with those who are harder to reach. 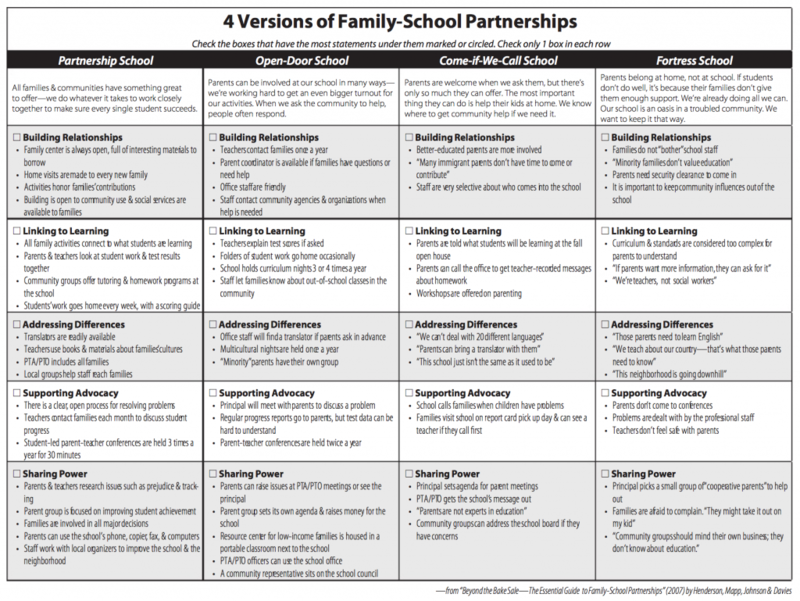 Explore current family-school relationships. Frameworks such as the one provided by Henderson, Mapp, Johnson, and Davies (2007) in Beyond the Bake Sale: The Essential Guide to Family-School Partnerships can be adapted to meet the needs of your family-school community to foster discussion about the nature of the family-school relationship, the purposes/goals, and the current school climate. One Response to Partnership, Engagement, Involvement: Is It Really Just Semantics? I work at a private school in Monterrey, Mexico where parental involvement is actually built into the curriculum. Every Thursday for the first 20 minutes of the day, one of my student’s parents leads an activity (called Parent Quality Time) that links to our school values (Respect, Responsibility, etc.). I appreciate how moms and dads volunteer their time to familiarize themselves with their child’s classmates while helping develop social skills and self awareness. Even though our school runs at top speed and we never seem to have enough time, we value our QT time and the students appreciate having these visitors. As you said, “Families need to value, and be valued for, their role as ongoing educator, partner in their children’s learning and well-being.” Each and every person that a child spends time with plays a significant role in their educational, social, and emotional growth. Parent QTs are just one way to strengthen familial involvement within schools.